Portrait of Asmita Kamal, 24, inside her classroom at Bayly Memorial School, Barotu Village, Ra Province on Fiji's largest island, Viti Levu. Bayly Memorial School was badly damaged during Cyclone Winston in 2016. The Category 5 storm ripped the roof off all classrooms and destroyed all of the books and school supplies. Asmita was supposed to move into her dorm on the school grounds the day the storm hit. Instead, she stayed with her family to help protect them and their home. She returned to the school to find it in ruins. Twenty-four-year old Ashmita Ashwin Kamal knew she wanted to be a teacher from a young age. Intelligent and passionate about passing on knowledge to the next generation, the 24-year old from Dugavatu, in Fiji’s Rakiraki Province, takes pride in both her home and her school. Located in Viti Levu on the western side of Fiji, Rakiraki is an area of green valleys, lush beauty, and an enormous community spirit. It’s the only place Asmita has ever called home. 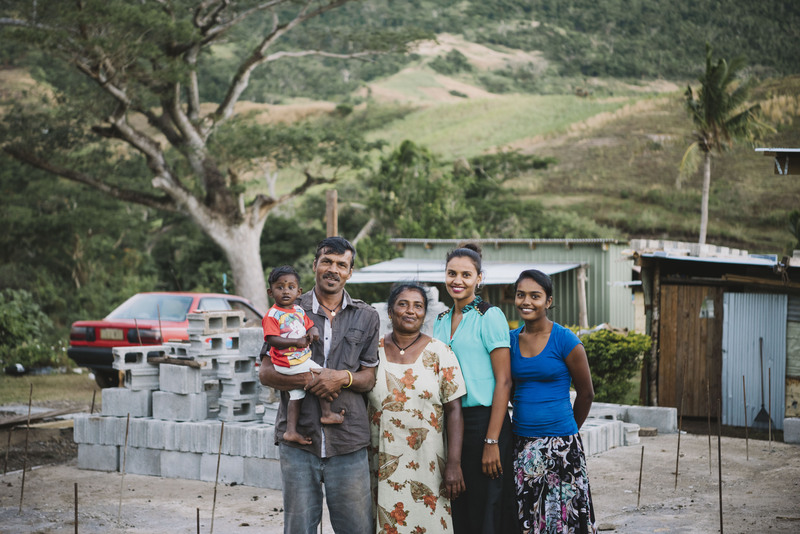 A portrait of Asmita Kamal (second from right), her youngest sister (right), her parents and her nephew on the foundations of what will be their new house. Yet less than a year after beginning her position at Bayly Memorial School, Asmita and her students’ lives were threatened when Category Five Tropical Cyclone Winston bore down on the area in mid-February 2016. As the cyclone moved closer, students were sent home due to the heavy rain and winds, and Asmita joined her family in trying prepare their home for what was to come. As her parents and uncle tried to secure the house, Asmita was tasked with protecting her elderly grandmother and younger brother and sister. For several hours, they were at the mercy of the storm, huddled under furniture, waiting for the calm. Asmita Kamal 24, stands on the foundations of her family’s new home in Dugaratu, a remote village near RakiRaki, in Ra Province, Fiji. Behind her are the remnants of her old family home and a new dwelling, constructued using Government support folowing the devastation of Cyclone Winston. For Asmita, the heartache of losing her family home was compounded on return to her school, which was severely damaged: the roof of the school had been ripped off, two classrooms were badly damaged, and most of the school’s resources – particularly books – were destroyed by the Cateogry Five winds and rain. 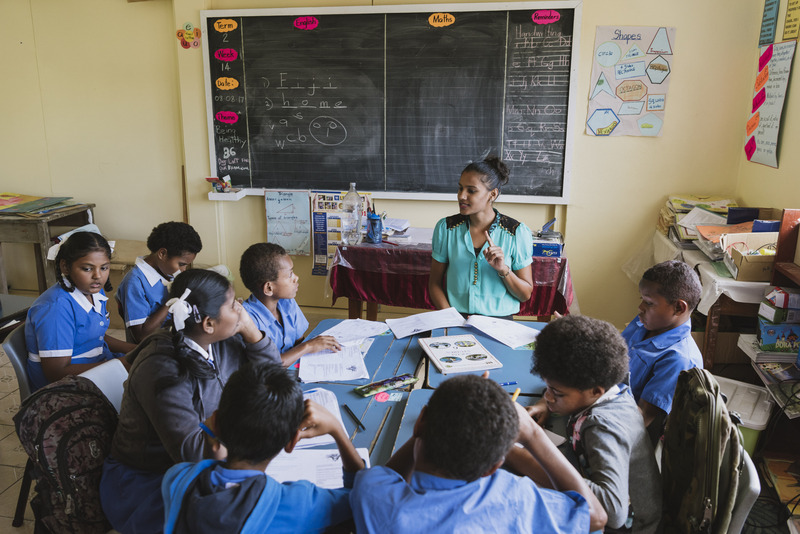 Asmita Kamal, 24, leads a revision class for end-of-term exams at Bayly Memorial School, Ra Province, Fiji. Asmita had been teaching just 5 weeks before Cyclone Winston hit in February 2016. 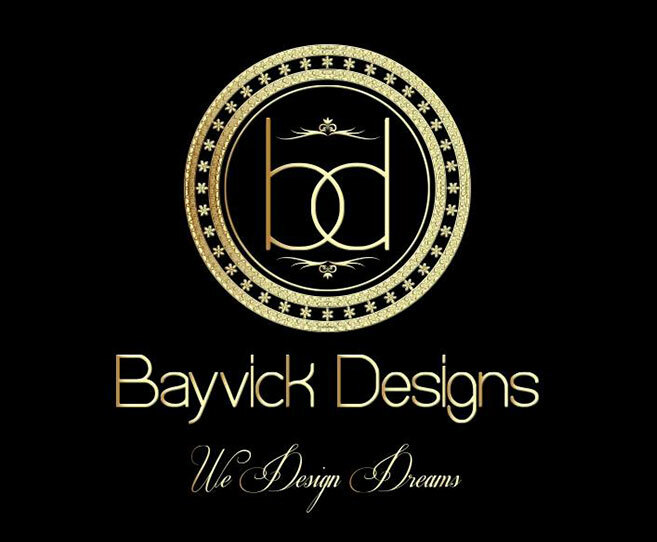 Today, Bayly Memorial School is a work in progress; being rebuilt slowly after Cyclone Winston. The typical sounds of a school – laughter, songs and chatter – are, at least for the moment, frequently mixed with the sounds of drills, hammers and generators. 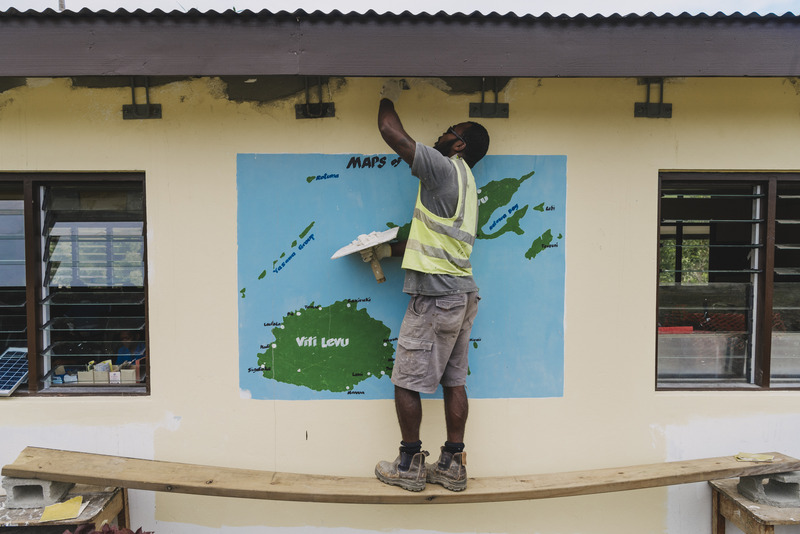 A workman puts the finishing touches of paint on Bayly Memorial School after a 18 month rebuilding effort following Category 5 Cyclone Winston in February 2016. The storm was the strongest ever on record for the southern hemisphere and hit Fiji’s Ra Province, where Bayly Memorial is located, first. High winds ripped the roof from the school building and destroyed all of the school furniture, books and supplies. For two terms, the 42 primary school students attended class at other schools. In August 2016 (Term 3), the school reopned with two out of four classrooms. As of July 2017, two classes fit in each classroom. In August 2017, the final two classrooms were expected to be complete. Yet Winston has also brought a new level of understanding in the classroom, with Asmita now ensuring the children learn and understand the causes and impacts of climate change as part of their curriculum. Asmita and her fellow teachers regularly attend climate change workshops to pass on the latest information to their students, including emergency drills focusing on storm preparedness. Since the school’s reopening, Ashmita has noticed that her students seem keenly interested in her climate change classes. For Asmita’s family, the post-Winston period has been difficult. After many months of living in a temporary structure her carpenter father had built after the storm, they will all soon to move into a new home. At a community level, she hopes that greater work is put into educating people about the dangers of cyclones through informative videos and community meetings. For the moment, Ashmita is focused on hope; that despite climate change her village will remain safe.